The UFO floating home concept from mini yacht-maker Jet Capsule offers a completely off-grid existence. Image source. Known for its exquisite cuisine, prominent fashion scene, and storied football clubs, Italy will soon have the ability to add yet another notable notch to its esteemed culture belt: manufacturer of UFOs. 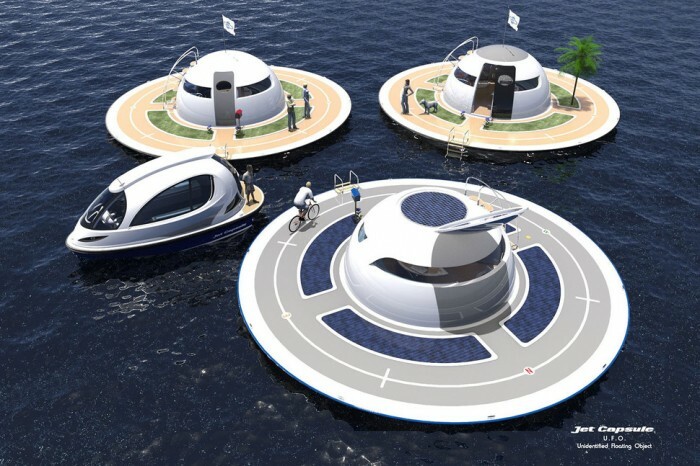 Also known as Unidentified Floating Objects, the UFOs coming to Italian shores in the near future aren’t exactly alien but rather an innovative solution for fighting the high costs of rent and the impending rise of the world’s sea levels. According to Digital Trends, artistically designed by the Italy-based company Jet Capsule, the floating concept is a small autonomous vessel that’s essentially a studio apartment on water. If you get seasick easy, we don’t recommend hopping on board to invest. Structurally, Jet Capsule’s UFOs measure just over 40 feet in diameter, with much of the vessel’s surface area taken up by a circular ring surrounding the living quarters. As seen in image renderings released by the Italian company, the outer ring could feasibly be used as a track for riding a bike, walking your dog or simply catching some rays. The mock-ups also show bits of grassy areas in sections surrounding the ring that appear to facilitate vegetable gardens and various trees. Once inside the capsule, each floating home contains two moderately sized livable areas. The upstairs houses the concept’s kitchen area, outfitted with a table and small seating area, as well as an access point to a short staircase leading to the bottom floor. Aside from a large window giving owners a front row seat for some gorgeous underwater viewing, the downstairs quarters also house a small bathroom and bedroom. If the renderings are indicative of a final product, privacy for those in the shower is extremely limited, though, only passing fish (or the occasional scuba diver) would actually be able to see inside. Aside from a large window giving owners a front row seat for some gorgeous underwater viewing, the downstairs quarters also house a small bathroom and bedroom. If the renderings are indicative of a final product, privacy for those in the shower is extremely limited, though, only passing fish (or the occasional scuba diver) would actually be able to see inside. Jet Capsule’s livable UFOs are also designed to utilize the surrounding environment to produce and store energy. For instance, the company intends to install wind and water turbines to generate power while also installing solar panels on the vessel to harness solar energy. If the vessel takes in more energy than it uses, the excess is simply sent to an internal battery fitted in the base of the UFO. Owners will also have the ability to control an electric anchor from inside the ship, which is used to keep the UFO in one position. While changing locations, the vessel has the ability to travel at speeds of up to 3.5 miles per hour — not exactly a blistering pace. If the vessel takes in more energy than it uses, the excess is simply sent to an internal battery fitted in the base of the UFO. Owners will also have the ability to control an electric anchor from inside the ship, which is used to keep the UFO in one position. While changing locations, the vessel has the ability to travel at speeds of up to 3.5 miles per hour — not exactly a blistering pace. As of now, Jet Capsule is currently seeking investors to help it develop the first working prototypes of its aquatic UFO. Like any concept, however, the likelihood of these vessels seeing the light of day remains scarce., but if rent prices continue to skyrocket (and water levels continue to rise), living in an aquatic house might not be all that strange.